Keep leather boots as dry as possible. If you have a boat with leather seats, have a leather living room set in your basement, or frequently forget to bring your leather boots or bags in from outside, it's likely you will have to remove mold from leather at some point. Although this task isn't pleasant, it certainly can be done. Mold is a living thing, a fungus to be exact, that is primarily airborne. However, when it lands on a hospitable area, such as a leather sofa or handbag, it latches on and reproduces. This means you need to take care of mold on your leather right away. If you let it go for a while, the problem will only get worse. It becomes more difficult to remove the more mold there is, and it can even spread to other items nearby. Just because you notice something brown or black on your leather doesn't mean that it is automatically mold. The stain could be dirt, ink or any other number of substances. If the substance isn't mold, the cleaning tips in this article may not work. Even if they do, you could save yourself some time and effort by using a different method more catered to the stain. It's usually mold if it has a puffy or fuzzy appearance and a very irregular shape. Severe mold will also have a strong musty smell. If you have to remove mold from leather, especially if it is a large item like a sofa, you should wear a protective mask, long sleeves, long pants, rubber gloves and goggles. The act of cleaning will release mold spores into the air that can damage your lungs if you're not protected and the cleaning solution can harm your eyes and skin. If at all possible, move the leather item outside. Scrape as much mold as you can off the surface with a dry nylon brush. Add four cups of lukewarm water to a bucket and put in a drop of liquid dish soap. 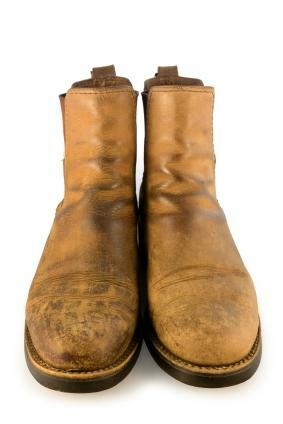 Dip a cotton rag in the soapy water, wring it out and scrub your leather, following the grain. Check to see if all the mold comes off. If not, scrub again. This time use a new rag soaked in two cups of water and one cup of rubbing alcohol. If any mold remains, try scrubbing with the alcohol solution and a soft-bristled toothbrush. Let the leather air dry in the sun. Treat the item with leather conditioner by gently rubbing it in into the leather in a circular motion. Don't keep any of the cleaning solution or the rags or toothbrush. If you attempt to reuse any of the items, you'll just be spreading the mold around. Also, if the leather you're trying to clean is fancy or expensive, test all cleaning solutions in a small area before using them on the entire item. Think of cleaning up any of these conditions as part of the process of how to remove mold from leather. If you don't correct them yet continue to store your leather item as before, you'll be repeating the process fairly often.